Feathers Fly As Top Turkish Officials Square Off Over Twitter Ban : The Two-Way After Prime Minister Recep Tayyip Erdogan moved to shut down the social media service to quiet opposition, the country's president tweeted his objection to the ban. A move by embattled Prime Minister Recep Tayyip Erdogan to shut down Twitter in Turkey looks to be backfiring. The hashtag #TwitterblockedinTurkey quickly spread upon news of the ban, and the country's own president tweeted his disdain. As we reported Thursday, Erdogan is running for re-election amid accusations of corruption buoyed by alleged evidence that has circulated on social media. Local polls are set for March 30. The Wall Street Journal elaborates: "Twitter has become a vehicle for allegations of government graft since December, with daily leaks of documents and voice recordings purporting to tie Mr. Erdogan to the investigation. The social-media site has also been an effective tool for the opposition to mount anti-government campaigns and protests since nationwide demonstrations in June." On Thursday, Erdogan — who has dominated Turkish politics for more than a decade — vowed to "wipe out" Twitter, and the courts quickly made it official in a ban that's been likened to a digital coup. "We'll eradicate Twitter. I don't care what the international community says. Everyone will witness the power of the Turkish Republic," Erdogan said. 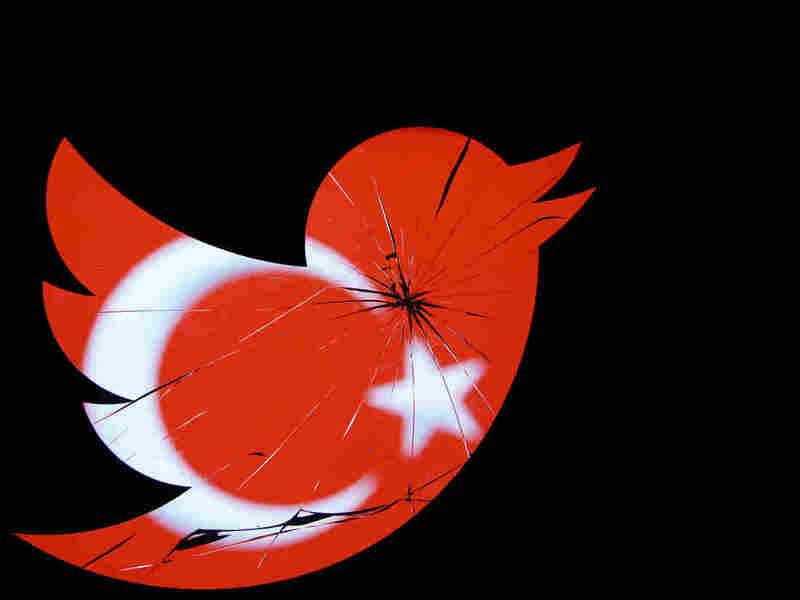 But, as The Washington Post reports, after Turkey's Twitter was supposedly disabled, "the hashtag #TwitterisblockedinTurkey went supernova, though Twitter is still accessible via the site's SMS service, which allows Turks to text in a tweet." And that's just what a defiant President Abdullah Gul did, sending a text-to-tweet that read: "One cannot approve of the complete closure of social media platforms." Gul, considered a political ally of Erdogan, said he hoped the ban would be short-lived. His tweet was joined by others from across the globe, as "thousands of Twitter users dispatched outraged — and sometimes hilarious — updates and photos touching upon feelings of dismay, humor, resignation," the Post says. According to the Journal, Turkey is one of the top 10 users of the San Francisco-based social media service. Deputy Prime Minister Ali Babacan defended the Twitter ban during an interview with NTV news channel. According to NTV, Babacan "echoed Erdogan's charge that a 'parallel state' is running a defamation campaign to topple the government," calling the matter a "national security issue." "You end up having to choose the better one of the bad options; it's not good for the perception of Turkey," Babacan said. "I don't anticipate the Twitter ban to last very long." "Erdogan's showdown with Twitter has been long coming. In mid-2013, thousands of protests ripped across Turkey ostensibly in opposition to a proposed urban development of Istanbul's Taksim Gezi Park. But many say that discontent was more rooted in the government's shift away from secularism — Erdogan is Muslim — and its recent crackdown on freedom of press and expression."